Pat the cat has invited all of her friends to a pajama party. Deep in the night, as many drinks are drunk, all the animals sit in a circle and start a spin-the-bottle game of their own. Pyjama Party is an animal stacking game for one to 8 player made with Hélène Menanteau and illustrated by Delphine Fourneau. It’s better suited for the bar with a glass of wine, a pint of beer or a shot of whisky. 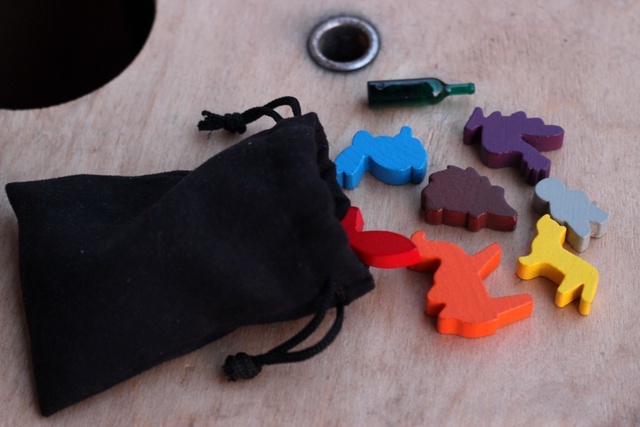 Thrown on the table like dices, the animals determine the order they should be stacked in, while the bottleneck points to the next player. Pyjama Party had a successfull campaign on Ulule and around 1000 units were sold.